Washington Gov. Jay Inslee is taking steps toward a presidential bid, forming a federal political-action committee and soliciting money he could use to travel to early 2020 primary and caucus states, The Seattle Times and the public radio Northwest News Network have learned. The committee, Vision PAC, was quietly registered in early October by Inslee’s campaign treasurer, Philip Lloyd. Its first and only reported donation so far is $5,000 from Blaine Tamaki, a longtime Yakima attorney and major Inslee political contributor who was appointed by the governor to the University of Washington Board of Regents last year. Over the past year, Inslee has boosted his national profile and traveled the country as chair of the Democratic Governors Association (DGA), furthering speculation about his 2020 ambitions. His DGA term ends this week, cutting off that travel budget. While Inslee has talked previously about keeping his 2020 options open, the newly revealed federal fundraising is the most concrete evidence to date that the two-term governor is serious about possibly entering what will be a crowded Democratic presidential field. Janet Pauli, a longtime Inslee supporter who lives on Bainbridge Island, said she and her husband pledged $10,000 to Inslee’s exploratory effort after she received a personal phone call from the governor Thursday. Pauli said Inslee discussed the donations paying for expenses including travel to the first four Democratic primary and caucus states: Iowa, New Hampshire, Nevada and South Carolina. Raad said Inslee “has no current plans to travel at this time” to those states. Inslee was scheduled to be in New Orleans this weekend for an annual DGA meeting at which his successor as chair will be chosen. He was in San Francisco last week on a political trip about which Raad declined to provide details. While in California, Inslee visited the site of devastating fires in Paradise and recorded a video standing in front of a medical center that had burned to the ground. In it, Inslee sounded very much like a presidential candidate, as he challenged President Donald Trump on climate change. Colorado Gov. John Hickenlooper, another Western Democrat considering a presidential run, recently created a similar PAC, according to The Colorado Sun. Federal law allows potential presidential hopefuls to “test the waters,” raising money to pay for expenses including travel and polling, without formally registering as a candidate, said Adav Noti, a former Federal Election Commission attorney and senior director of trial litigation at the Campaign Legal Center, a nonprofit that advocates for enforcement of campaign-finance laws. If he does decide to run, Inslee likely would have daunting competition from better-known and better-funded Democratic primary candidates, including Vermont Sen. Bernie Sanders, California Sen. Kamala Harris and Massachusetts Sen. Elizabeth Warren. Even Pauli said she’s been a fan of another possible 2020 candidate, Texas Democratic Rep. Beto O’Rourke. But, she said she thinks Inslee has a lot to offer. Inslee’s ambitions have been rumored for months, with some political insiders suggesting he could position himself for a Cabinet post in a Democratic administration even if his campaign fails to gain traction. At a recent fundraiser in Olympia for Inslee’s gubernatorial campaign, the governor made comments some interpreted as evidence of his national ambitions. 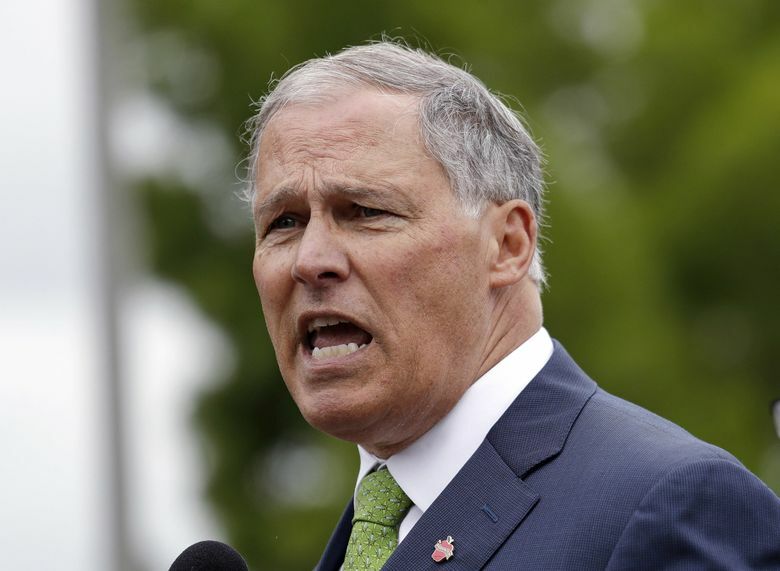 Still, Manning, a former president of the Washington Environmental Council who shares Inslee’s passion for fighting climate change, said an Inslee candidacy would be beneficial to the cause of climate action. Even an exploratory run for president may prove complicated for Inslee, who faces a 105-day legislative session that will convene in January. Inslee is expected to release his proposed budget in December, tackling issues including climate change, education and mental health. The last serious presidential candidate from Washington state was U.S. Sen. Henry M. “Scoop” Jackson, who competed for the Democratic nomination in 1976, dropping out after losing the Pennsylvania primary. As DGA chair this year, Inslee has crisscrossed the country meeting donors and political insiders in many states, including visits to Iowa and New Hampshire. In the end, Inslee had some bragging rights as Democrats picked up seven governors’ seats previously held by Republicans. Inslee’s DGA role garnered him increasing national media attention and made him a semiregular guest on cable news shows as a fierce critic of Trump on issues including gun control and refugees. In interviews and on social media, Inslee has increasingly stressed that Democrats must nominate a challenger in 2020 who — like him — regards climate change as a top political issue. The governor’s frequent out-of-state trips have helped bust the budget of the taxpayer-funded State Patrol detail that travels with him for protection. The patrol is asking for a $1.3 million increase for the unit, predicting Inslee’s out-of-state travel will only increase over the next two years. As he teases out a possible presidential run, Inslee separately has continued raising money for his gubernatorial re-election in case he decides to seek a third term. His campaign account reported about $280,000 cash on hand as of the end of October. A pre-legislative session fundraising freeze on soliciting or accepting donations for state campaigns, including Inslee’s gubernatorial committee, begins Dec. 15. However, state law allows Inslee to continue to raise money for the federal PAC even during the freeze, according to a spokeswoman for the state Public Disclosure Commission. This article was reported in partnership with Austin Jenkins of the public radio Northwest News Network.